The People's Bank of China injected 120 billion yuan ($18.7 billion) worth of seven-day reverse repurchase agreements, or short-term loans to commercial lenders, into the interbank market on Tuesday. It was the largest single-day injection by the central bank since January 2014, when the PBOC offered 150 billion yuan via 14-day reverse repos. The interest rate remained the same at 2.5 percent. Experts speculated that tightening liquidity in the market amid intensified capital outflows has forced the bank to increase money supply and stabilize the financial market. Capital outflows from China surged to a four-month high in July, after consecutive inflows since May, putting more pressure on monetary easing while strengthening expectations of yuan depreciation. According to the State Administration of Foreign Exchange, net sales of foreign exchange were worth 265.5 billion yuan last month, compared with a net purchase of 1.02 trillion yuan in June and 7.8 billion yuan in May. The sharp rise was blamed by economists on a combination of anemic export growth in July, ongoing devaluation pressure on the yuan, and an expected rise in US interest rates, which drew out liquidity from the domestic financial market. 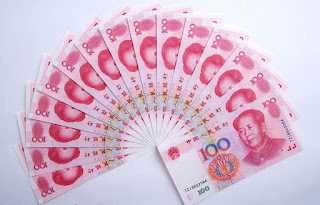 Li Qilin, an analyst at Minsheng Securities, said that the central bank's previous intervention to stabilize the currency by selling foreign exchange had also led to liquidity tightening and the propping up of the interbank lending rate. "We expected the PBOC to further cut the cash amount that should be held as reserves by financial institutions, to ensure sufficient long-term money supply in the financial market," said Li. The central bank suddenly cut the yuan's trading rate against the US dollar by 1.86 percent on Aug 11, after a two-day decline following the announcement the PBOC was reforming its daily yuan-dollar, mid-point fixing mechanism. Markus Rodlauer, the International Monetary Fund's mission chief for China, called the reform "a welcome step as it should allow market forces to have a greater role in determining the exchange rate". "Greater exchange rate flexibility is important for China as it strives to give market forces a decisive role in the economy and as it is rapidly integrated into global financial markets," he said. However, Wang Tao, chief economist in China at Swiss firm UBS AG, said that it is unlikely the PBOC will let only market momentum drive the yuan's exchange rate, as that can be destabilizing. Avoiding depreciation expectations and capital outflows, said Wang, has become more important for the government at the moment, in determining its next monetary step. Song Yu, chief economist in China at Goldman Sachs Group Inc, said that monetary policy loosening will likely lean toward reserve requirement ratio cuts and alternative loosening measures such as more lending to policy banks in the second half of this year. "The decision to allow modest depreciation of the yuan against the US dollar is likely a reflection of this," said Song. "We see allowing the currency to move more in accordance with market supply and demand as a welcome development, though the effect of further moves will likely be modest and closely controlled."